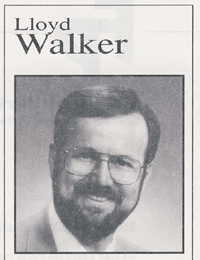 On May 31, 1995, Rogers Community TV (channel 13) in London, Ontario, and Radio 98 (AM980, London, Ontario) co-hosted a one-hour televised/radio-broadcasted candidates debate for candidates in the riding of London North, including Freedom Party candidate and leader Jack Plant, and the PC, NDP, and Liberal candidates. 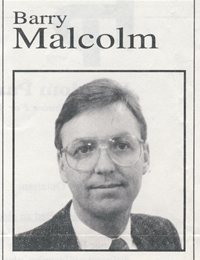 On May 30, 1995, Rogers Community TV (channel 13) in London, Ontario, and Radio 98 (AM980, London, Ontario) co-hosted a one-hour televised/radio-broadcasted candidates debate for candidates in the riding of Middlesex, including Freedom Party candidate Barry Malcolm, and the PC, NDP, and Liberal candidates. 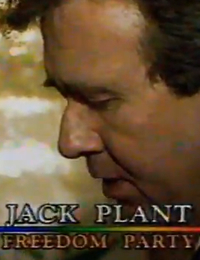 NOTE: this recording is captured from a 1 hour audio cassette (30 minutes per side). The first 20 seconds or so of the recording are of low volume/quality. Also, there is a temporary loss of audio at the 30 min: 50 sec. 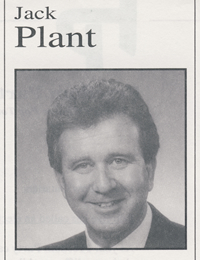 point at which the tape, when used to record the broadcast, was flipped over for the purposes of recording the second half-hour of the one-hour program. 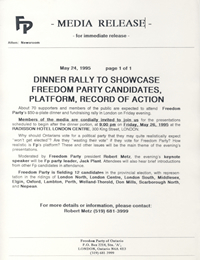 On May 26, 1995, Freedom Party of Ontario held a provincial election dinner at the Radisson hotel in London, Ontario. 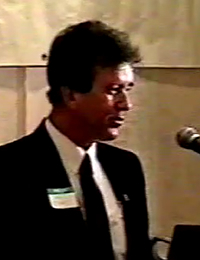 Freedom Party’s then-party leader, Jack Plant, gave his first speech to a Freedom Party gathering as party leader, and most of the party’s candidates took the opportunity to give a short, 2-minute speech to introduce themselves and share with attendees their stories of their experiences in the campaign. 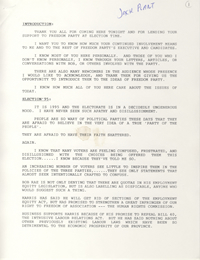 The night concluded with a short speech by the party secretary of the time, Robert Vaughan, who had been elected school trustee. 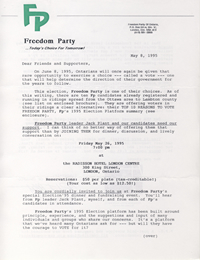 On May 24, 1995, Freedom Party of Ontario notified the media that Freedom Party would be hosting its “Election ’95” dinner in London, Ontario.